Men’s Basketball Secures Commitment from Djuricic, Visits from Bamba, Carter Jr.
Danilo Djuricic, a 6’8” stretch four from St. Michael’s College in Toronto, became the second member of coach Tommy Amaker’s 2017 recruiting class. Djuricic announced a verbal commitment to the Crimson on Friday afternoon at a press conference held at St. Michael’s. The decision comes less than two weeks after the high school senior visited Cambridge on Sept. 15th. The Brampton, Ontario native was also considering Ivy League foe Penn and received offers from seven schools. Djuricic joins Mario Haskett, a 6’3” shooting guard who is considered a three-star prospect by most major recruiting outlets, in Harvard’s 2017 recruiting class. Djuricic is considered a two-star prospect lauded for his versatility and has seen his stock rise in recent months after a strong summer. He averaged 11.4 points per game and shot 40.7 percent from three-point range in 20 games this summer while playing for CIA Bounce, a Brampton-based AAU program. Djuricic has international experience after playing for Canada’s U17 team in this summer’s FIBA U17 World Championship, which was held in Zaragoza, Spain. His squad placed fifth in a tournament, which was won by a U.S. team headlined by Harvard target Wendell Carter Jr. In seven contests, Djuricic averaged 12.6 points and 5.7 rebounds on 44.2 percent shooting from beyond the arc. Amaker, who cannot comment on players until after they are admitted to Harvard and sign a National Letter of Intent, is no stranger to recruiting north of the border. Laurent Rivard ’14, a Saint-Bruno, Quebec native, is the program’s all-time leader in three-pointers. Agunwa Okolie ’16 (Ajax, Ont.) and Patrick Steeves ’16 (Montreal) were key cogs on last season’s squad while junior Chris Egi (Markham, Ont.) and sophomore Corey Johnson (Ottawa) were teammates on Canada’s U19 team and figure to be focal points on this year’s Crimson team. It just might happen. With recruiting for finance and consulting taking over campus, the Harvard men’s basketball team has brought some of its own big names to Cambridge in recent weeks. The weekend of Sept. 17-18 saw what might be one of the most noteworthy events in recent memory for the Crimson—and none of this action was on the court. Over a two-day period, the No. 3 recruit in the nation, Wendell Carter, Jr., made his first official visit to Cambridge. 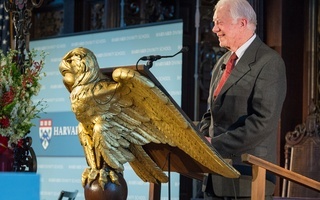 While other high profile recruits such as Brandon Knight, Victor Oladipo, and Jabari Parker have had their names tied to Harvard in the past, Carter is among the first to demonstrate a legitimate interest in matriculating. After his weekend in Cambridge, the Atlanta native narrowed his list to just four schools: Duke, Georgia, Georgia Tech, and Harvard. Carter’s decision comes as head coach Tommy Amaker has ramped his recruiting efforts in recent years. This year’s class was ranked No. 10 in the nation according to ESPN—marking the first time an Ivy League school has cracked the top 25. While most consider Duke to be the heavy favorite for the 6’9” power forward, many think that Harvard has a real shot. In an interview with SNY.tv, Carter discussed the possibility of coming to Harvard. 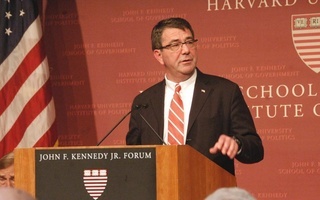 "That would really be a game changer,” Carter said. “That would be doing something that most athletes don't normally do." Also on the Crimson’s wish list is No. 4 overall recruit Mohamed Bamba. The 6’11” center unofficially visited Harvard on September 6th, but perhaps even more interesting is the fact that Bamba and Carter are close and have discussed the possibility of playing together in college. Carter would be the highest ranked recruit to commit to Harvard, besting current freshman Chris Lewis, a fellow Georgian, who was ranked No. 68 in the 2016 class, per ESPN. Carter’s decision comes as the Crimson enters the season with high hopes following a lackluster 2015-16 campaign that saw Harvard finish fourth in the Ivy League. While the addition of Carter would bring Amaker’s recruiting success to another level, the additions of players like Haskett and Djuricic continue to separate Harvard from its Ivy League peers in recruiting circles. Addressing over 50 students at a kick-off dinner for Black History Month Friday night, Assistant Professor of Sociology Prudence L.
Yale Law School Professor Stephen L. Carter argued the relevance of slavery in the United States by addressing its impact on the law in the first installment of his W.E.B. Du Bois Lecture Series on Tuesday.